Darker than lokta, with a strong figured, marbled finish, buff in colour. 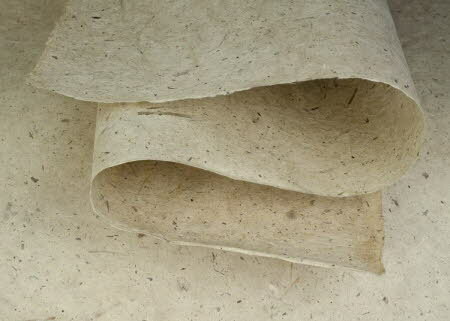 Banana paper is heavier in weight than lokta and the textured finish, full of fibre inclusions, would make it ideally suited to an antique look and the production of unique and distinctive documents, book binding etc. This medium to heavy-weight 30 inches by 20 inches - 100 gsm paper has a beautiful deckled edge (pack of 3 sheets).